With this article, I would like to introduce a new type of article, interviews with professional fly fishing guides. I hope to offer a series of such articles. For this inaugural article, I had the pleasure of spending a morning talking with Tommie Lawhorne, professional guide and co-owner of The South River Fly Shop in Waynesboro, Va. He grew up in Nelson County, and is well known in the community at large, as well as the fly fishing community. Q: So Tommie, how did you get started fishing? Both my father and grandfather were fishermen, and they started me fishing when I was four or five years old. My first pole was just that, a long bamboo pole. We grew the bamboo, then cut and dried it. A short piece of line was attached to the end, from which I dangled a baited hook. It was really fishing just like the current Tenkara fad. From there, I quickly progressed to spin fishing. I grew up along Stoney Creek, which at the time was probably the best native trout stream in central Virginia. It drew local fly fishermen, like Tim Hess, Tim Merrick, and Kyle Lynn. I was captivated by their casting and fishing techniques, and started fly fishing when I was twelve or thirteen. My first rod was an Eagle Claw fiberglass rod, a 6 foot 6 inch 5 weight. By the time I was fifteen, I was pretty good at catching those Stoney Creek Brookies. When I was nineteen, I started my career as a professional fly fisherman, working at the Stoney Creek Tackle Company, which was then located at the Valley Green Shopping Center in Nellysford. At first I only worked in the shop, but I had the opportunity to spend time fishing with Chuck Craft, one of Virginia’s best known guides, who guided for the shop. My second year there, I began guiding. After a few years, the Stoney Creek shop moved to Charlottesville. I had moved to Waynesboro, and rather than commute to Charlottesville, I took a job at Hassett’s Outdoors in Waynesboro. They didn’t offer guide services, but I continued to guide and teach fly tying on my own. 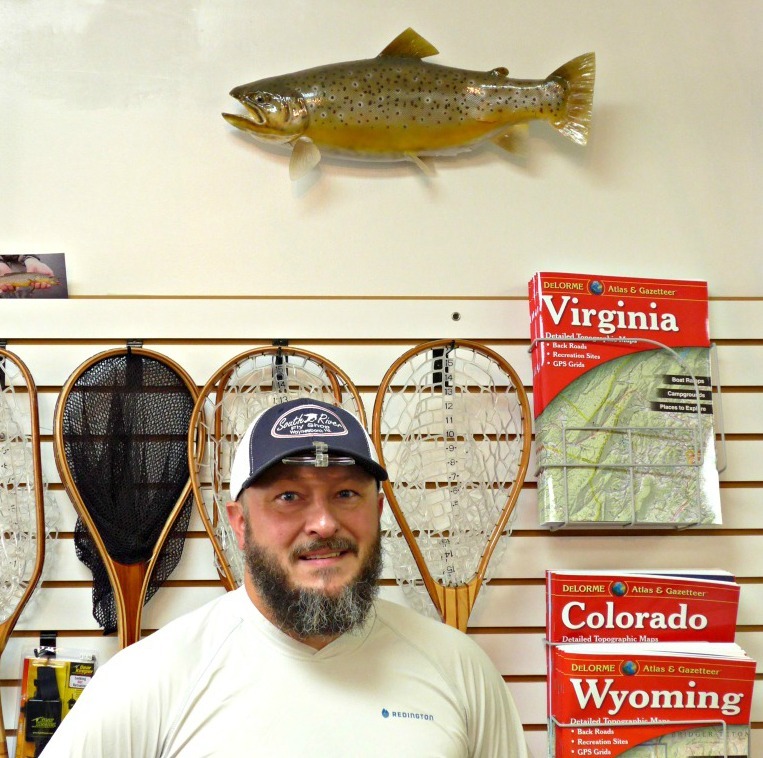 Q: How did you transition from being a fly fishing guide to being a co-owner of a fly shop? I met my co-owner, Kevin Little, while fishing on the South River in Waynesboro in 2001. He was also an experienced fly fishing guide, and we quickly discovered our mutual interest in having a real fly fishing shop in our community, one offering a friendly source of fly fishing information, a wide variety of fly fishing equipment, fly tying materials, and guide services. Unfortunately, we were not in a position to open a shop at that time, but we never lost sight of our dream. Ten years later, in 2011, we opened the South River Fly Shop on Main Street in Waynesboro. 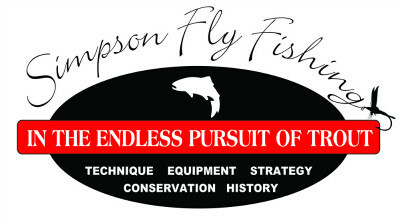 Q: Is there a type of fly fishing that you are most passionate about? Oh yes, my true love is fishing for native trout, whether it be cutthroat in the west or brookies here in the east. I like to get away from the crowds, and appreciate the pristine environs required by these fish that are so sensitive to habitat degradation. As they say, “trout don’t live in ugly places”. My second choice is fishing for wild trout. Q: Would you offer any advice for fly fishermen? Patience! Fishermen should take the time to thoroughly study a stream, to understand the changes that occur seasonally, the impact of weather conditions, the movement of trout during these varying conditions, where they hold, and where they feed. I see so many fishermen spot a prime lie, and rush into the water to fish it. In their haste, they wade through good water, missing the opportunity to fish it, and spooking fish that often flee into the prime spot, which spooks the fish there as well. So be patient and deliberate. Q: Do you have a favorite fly or flies? For brookies, I like a #14 yellow stimulator. Q: You are very generous with your time, and have been involved in a variety of community activities. Would you like to share some of that with us? Certainly. I’m very passionate about conservation, especially coldwater conservation. A number of years ago, our local Trout Unlimited (TU) chapter was in danger of losing its charter due to a lack of interest and leadership. I volunteered to serve as president, which I did for seven years. I appealed to the local fly fishers that I knew, asking them to get involved. They responded, and we began a number of stream restoration projects, including five major structures on the South River Delayed Harvest Area. We started the “Trout in the Classroom” program, a national TU project, which provides a fresh-water aquarium with plants and trout to participating grade schools, as well as a conservation curriculum. We currently have eighteen classrooms in our local schools participating. We also offer programs for the local Boy Scouts, which have a fly fishing merit badge. I also work with the Waynesboro Downtown Development group, serve on the board of Waynesboro’s Storm Water Management program, head the Two Fly Tournament to raise money for TU, and participate in The Virginia Fly Fishing Festival here in Waynesboro. Q: Do you have any concerns about our sport of fly fishing? Yes. While there has been a strong growth of interest in fly fishing, there continues to be a loss of access to trout streams. Landowners that used to grant access, now post their land. Some are privatizing their streams, stocking them, and offering access for a rod fee. Many fly fishermen find these attractive, because it is so easy to catch the trout in them. Consequently, they never acquire the skills necessary to fish our public waters, and they lose interest in addressing the conservation needs to preserve and protect our public streams. Increasingly, the only trout streams available to the public are those in national forests, parks, and other state or federally owned land. And of course I am concerned about the continued degradation of our watersheds. Acid rain, destruction of stream banks by grazing practices that lead to wide, shallow streams, loss of riparian areas and wetlands, have all caused the loss of habitable trout streams here in Virginia and elsewhere in our country. I wish that more people would become involved in conservation organizations to help address these problems. Thank you, Tommie, for taking the time to share some thoughts with our readers. I share your concerns, and hope that more fly fishers will answer the bell to preserve our trout streams, and assure free, public access to them. Honored to included in FeedSpot's top 75 Fly Fishing blogs!